Last year I talked all about camping and shared my favorite fire starter ever – laundry lint! Camping season is upon us and I have improved my little lint system. The biggest complaint I had about lint is that its messy. I usually keep it in a baggie. But then I saw on Pinterest how someone put lint in a toilet paper tube. I loved the idea so that you had paper too but the problem was it still was messy. So I decided to wrap it in the weekly ads that come in my mail when I’m done with them. 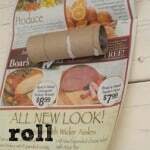 Just stuff the lint in the roll, and then roll it up in newspaper, and tuck the ends in. It makes a really tight roll that doesn’t let any of the messy lint out! If you want more paper to light fires just wrap more layers around the toilet paper roll. Scouts now recommended to use saw dust from natural wood and mix it with wax and put in into a cardboard egg container. Break off a section and you have more natural fire starter without all of those toxins. I think that is great but the only problem is those are not easily accessible materials for me. One of the things I like about the lint, toilet paper rolls, and newspaper is that I am recycling things I usually just throw away into something I actually use. Laundry lint is so flammable and works great for fire starting. 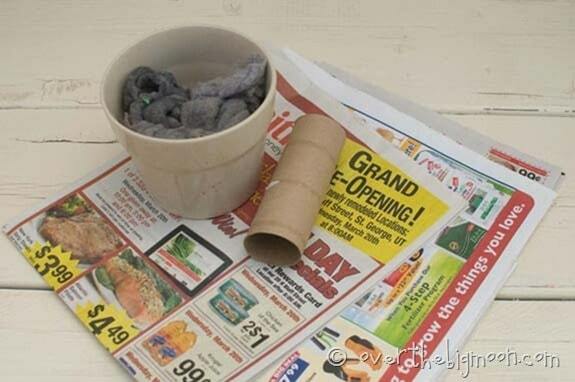 With the newspaper and added paper from the toilet paper roll it gives you just the right amount of paper. Want to keep up with us at Over the Big Moon….click here to learn how to subscribe! This was already asked but no response …. are theses safe to use in a ” in home ” fireplace ???? Anybody know ?? Honestly, I probably wouldn’t. But, I don’t have an in home fireplace, so am not qualified to say for sure or try it. Thanks for the comment. Ever thought of vegetable oil impregnated cardboard!? We light our fires with this throughout the winter and it’s brilliant – and no toxins- come on, you’re a camper and you have a responsibility to the environment! . I would imagine that impregnated cardboard inside your tubes with the paper wrap would work superbly and all materials are readily available. I am talking old veg oil here- not new. Don’t wash it down the sink- use it. Yes, they are. Put them under your kindling and light them. We mix the lint with melted wax – old candles, store bought paraffin, store bought candles from the dollar store, but this method works well, also. You can also stuff the lint into a cardboard egg container then cut out the individual cups and light the container. It burns well. If you are using lint, it’s better to use the lint from a load of towels… they are cotton and work the best. Lint from synthetics just don’t burn as well and have a tendency to give off a chemical odor. I use this method to start my Wood burner and it works great. I don’t wrap in paper but th!the makes sense so the lint don’t fall out. Stuff mine rather tight also . This did not work for me. It would burn for a minute, but then the flame goes out and it just smokes. I even tried not packing the lint in too much and not using the newspaper -thinking it needed better air flow, same result. Any tips? Honestly, I’m so surprised! I have had it work handful of times! The combination of the two have always worked! Sorry I can’t be more help! 1) Think about piercing the exterior because fire requires 3 things: (1) air (2) fuel (3) heat source. Try adding air holes right before you put in fire to keep fluff inside, add pieces of old candle wax in with the dryer lint (we use towel lint) but you can also use shredded paper. I always make a test fire starter and time to see how long it burns. Mine generally burn for 20-30 minutes depending on how big of wax chunk I include. I have tried this and it hasn’t worked. A couple small or one bigger pine cones in TP tubes with the lint might be helpful too. There is an easier way and that would be to fold the tp rolls in on both sides to make a package. Can this be used in a fireplace? I like this idea. I have been making mine from: dryer lint stuffed in cardboard egg cartons with wax poured over the lint. One little egg section will start a campfire! My boyfriend thought I was crazy, until he saw them work. We all have paper shredders now for privacy so couldn’t you just stuff the tube with that instead of lint? Just an idea. You could, but laundry lint is just so much more flammable. I have several dogs, and this just stinks! I use old taper candles, broken into pieces, and wrapped in waxed paper. Works great! We love this method and used it for our backyard fires (in a pit) last summer. I love the idea of rolling it in paper too. Until I read this I had been folding in the ends so the lint wouldn’t escape. Thanks! Love this! We too have a a large Ziploc bag full of lint on top of the dryer. I like this tidy way of storing it. Thanks for sharing!